Reuters announced on Wednesday 11th March of this year that LiveMocha.com and Pearson Education Publishing (owners of Longman Publishing) have teamed up to provide a English as a Foreign Language e-learning service marketed directly to consumers. It’s essentially a social networking website, similar to Facebook, for example (it evens includes a Facebook linking plugin) that is specifically geared towards people who want to learn foreign languages, not just English. It currently offers Arabic, English, French, German, Hindi, Icelandic, Italian, Japanese, Korean, Mandarin Chinese, Polish, Portuguese, Russian, Spanish, Turkish and Ukrainian. At present, LiveMocha.com boasts over two million members who can connect with potentially thousands of other members who have similar or complementary language learning needs. Membership is free and simple to set up although it appears to make its money through plenty of banner advertising which seems to permeate every corner of the site. Once you’ve created your personal profile, LiveMocha.com immediately starts suggesting potential language learning “friends” of different ages and backgrounds from all over the world. So basically, this is a Web 2.0 version of the traditional pen-pal exchanges of our school days. Of course, the web offers far more for communications than the traditional pen, paper and international postal services. One thing I’d strongly recommend here to anyone who’d like to use this service is not to put any “identity sensitive” information, i.e. information that fraudsters could use to steal your identity, such as your date of birth, home town, surname(s) or middle names, etc. From what I can see, the real strengths of this website are in its emphasis on social networking and peer review. Members can write compositions or record and submit speech that they submit for other members to review, grade and give advice. For example, you could write or record and submit a short paragraph about your favourite past-times. Other members are notified about your submission and they can read or listen to it and either write or record their assessment of it. There’s also a basic grading system for giving marks out of five for spelling/pronunciation, quality and grammar. Since this is a social networking website with an emphasis on conversation and communication, I at least expect to see some way of calling other members through a VoIP service (Voice over Internet Protocol) such as Skype, GoogleTalk, Messenger. What they provide is a chat window with the option to use their proprietary VoIP service. I tried a few times to connect to a variety of other members but without success. There doesn’t appear to be any kind of discussion forum or bulletin board which is a shame. Bulletin boards are especially effective at encouraging realistic dialogues between learners as has been amply demonstrated by Dave’s ESL Cafe. It does have chat, however, which appears to work well for one-to-one communication which is probably better than the majority of group chatrooms that frequently descend into a linguistically challenged “free-for-all”. They also provide a number of language “courses” that appear to be aimed at learners from complete beginners to Pre-Intermediate level. The materials are very basic and some are either frustratingly slow or don’t appear to work at all (I have a pretty fast and reliable Internet connection). The materials appear to be SCORM based and I suspect that they’ve been authored using some kind of automated SCORM IDE. This could explain why they’re so slow. SCORM IDEs tend to produce very large file sizes, typically between 10Mb and 100Mb, for activities that should only be a fraction of that, usually less than 1Mb. To be honest, I don’t think this site is going to win any awards for its e-learning course materials. 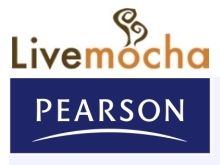 Why the LiveMocha.com – Pearson partnership? I guess that this is where the partnership with Pearson comes in. LiveMocha.com have the framework and an established on-line language learning community that is well advertised and well used but doesn’t have much in the way of course materials, while Pearson have a huge library of language learning course content for learners at every level. It would be great to see LiveMocha.com offering integrated, well designed courses that would incorporate and complement their very successful social networking framework. I await further news on their progress with this project!